… ich weiß, ich weiß:, ist ganz schöne Schönmalerei, fands nur ulkig, dass es über uns ein Lied gibt . Am 05.06. haben wir den Film „Paris is burning“ gesehen, den wir nächste Woche besprechen werden. Texte hierzu findet ihr im Handapparat der Bibliothek (Ordner: „NORMAL“). Die Texte von Judith Butler und bell hooks liegen jeweils auch in deutscher Übersetzung vor. Es muss nur einer der Texte gelesen werden. 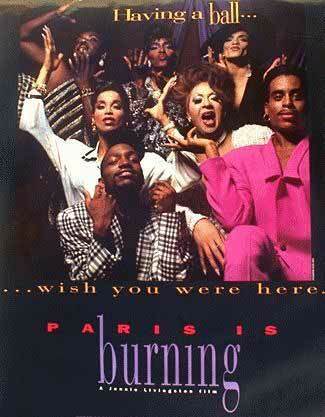 Paris Is Burning is a 1990 documentary film directed by Jennie Livingston. Filmed in the mid-to-late 1980s, it chronicles the ball culture of New York City and the poor, African American and Latino gay and transgendered community involved in it. Many consider Paris Is Burning to be an invaluable documentary of the end of the „Golden Age“ of New York City drag balls, as well as a thoughtful exploration of race, class, and gender in America. The film explores the elaborately-structured Ball competitions in which contestants, adhering to a very specific category or theme, must „walk“ (much like a fashion model’s runway) and subsequently be judged on criteria including the „realness“ of their drag, the beauty of their clothing and their dancing ability. Most of the film alternates between footage of balls and interviews with prominent members of the scene, including Pepper LaBeija, Dorian Corey, Anji Xtravaganza, and Willi Ninja. Many of the contestants vying for trophies are representatives of „Houses“ (in the fashion sense, such as „House of Chanel“) that serve as intentional families, social groups, and performance teams. Houses and ball contestants who consistently won in their walks eventually earned a „legendary“ status. Jennie Livingston, who never went to film school and who spent 7 years making Paris Is Burning, concentrated on interviews with key figures in the ball world, many of whom contribute monologues that shed light on the ball culture as well as on their own personalities. In the film, titles such as „house,“ „mother,“ and „reading“ emphasize how the subculture the film depicts has taken words from the straight and white worlds, and imbued them with alternate meanings, just as the „houses“ serve as surrogate families for young ball-walkers whose sexual orientations have sometimes made acceptance and love within their own families hard to come by. Drag is presented as a complex performance of gender, class and race, in which one can express one’s identity, desires and aspirations along many dimensions (see Drag). The African American and Latino community depicted in the film includes a diverse range of identities and gender presentations, from gay men to butch queens to transsexual women. The film also documents the origins of „voguing“, a dance style in which competing ball-walkers freeze and „pose“ in glamorous positions (as if being photographed for the cover of Vogue). Pop star Madonna would, one year before Paris Is Burning was completed, bring the phenomenon to the mainstream with her number one song „Vogue“. Du browst gerade in den Projekt Normalisierung Weblog-Archiven nach der Kategorie 'Video und Film'.